Winger terminated his contract by mutual consent after ten months in Dingwall. Ivan Sproule has left Ross County after the club agreed to terminate his contract. 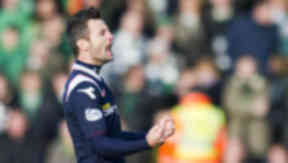 The Northern Irish winger had been with the Dingwall men since joining from Hibernian in January. A statement from Ross County said Sproule, 32, was leaving for personal and family reasons. A club spokesman said: “Ross County Football Club have mutually agreed to terminate the contract of Ivan Sproule with immediate effect due to personal and family reasons and his desire to return to Northern Ireland. Sproule made 24 appearances for the Staggies, netting eight goals. He previously had two spells with Hibs, either side of stints playing with Bristol City, Yeovil Town and Notts County.